A sturdy plywood gunter-rigged 12 foot sailing dinghy on a road trailer- Beccles, Suffolk. Lovingly built by my late husband on his day off in the 1960's hence the name 'Thursday's Child'. Originally billed as suitable for two adults and two children. Perfect without the mast and sails to potter on inland waterways with an outboard. Includes oars and a Bruce anchor. We sailed it two up in the river estuary. We have taken it abroad and used it in Brittany and the Netherlands when the children were small. The boat went on top of estate car (with the help of friends - it's a bit heavy) whilst the trailer travelled in the caravan in pieces. It is in good condition never having been stored in the open air, always in a garage. It has been unused now for several years so would benefit from a revarnish and thorough check, although I have no reason to believe there are any issues. I am moving house and will have nowhere to keep it and children now lead lives of their own. 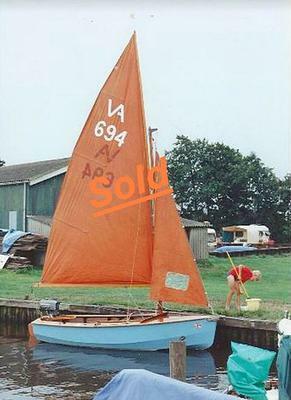 It was a much loved boat and I would just like it to have a new home where it will be equally loved and enjoyed. Located in Beccles, Suffolk on the edge of the Broads.